INTERNET EXPLORER IS no longer the most popular desktop browser in the world after it was dethroned by its biggest rival. Google Chrome now holds the top spot, with Internet Explorer only behind by the smallest of margins. The stats comes from NetMarketShare, a statistics site which measures the market share of browsers, search engines, and operating systems. As of April 2016, Chrome now holds 41.71% of all market share while Internet Explorer has 41.33%. Its closest rival is Firefox which only has 10.06% of market share while Safari and Opera have 4.47% and 2.01% respectively. A comparison of market share between Internet Explorer (blue), Chrome (green) and Firefox (yellow) since June 2015. Internet Explorer rose to prominence thanks to it being bundled with Windows 95 and subsequent versions of Microsoft’s operating system. It first surpassed Netscape Navigator in 1998 as the world’s most used browser and held that position until recently. At its peak, it accounted for 95% of the web browser market in 2003. However, the browser has experienced a fall from grace since the early 00s as more versatile browsers like Chrome and Firefox emerged. Security problems as well as issues with its speed and stability saw users switch to other web browsers. Add to that its fights with the EU, where it was forced to pay a fine of €860 million overall for abusing its dominant position, and its decline was slow and gradual. 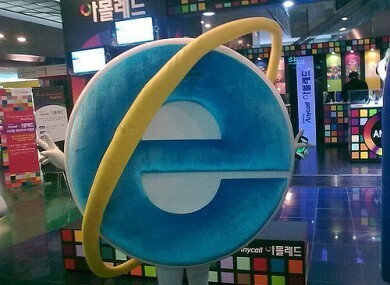 Microsoft is phasing out Internet Explorer entirely with 11 being the last and only updated version. In its place is Microsoft Edge, a lightweight browser which was included with Windows 10 since it launched in July 2015. Email “After 18 years, Internet Explorer is no longer the world's most popular browser”. Feedback on “After 18 years, Internet Explorer is no longer the world's most popular browser”.